There seems to be a bit of confusion on how the upgrade from an existing vCenter Server Appliance (VCSA) 5.5/6.0 to the upcoming VCSA 6.5 release will work. I suspect part of the confusion is also due to the fact that the underlying OS in the VCSA in vSphere 6.5 is changing from SLES to VMware's very own Photon OS. Before going into the upgrade details, I do want to mention that with this change, VMware will now own the entire software stack within the VCSA (OS + Application). This will allow VMware to quickly respond and deliver OS and security updates to customers at a much quicker rate than it was possible before. In addition, Photon OS is also a very optimized Linux distribution which has allowed VMware to significantly improve the reboot and startup time of the vCenter Server application. To be clear, the vCenter Server application itself is NOT running as a Docker Container nor are there any other application or services within the VCSA that is running a Docker Container, I know this was something folks were also assuming because the OS changed to Photon OS. Now going back to the upgrade question, how would an upgrade work if the underlying OS is changing? The answer is actually quite simple. 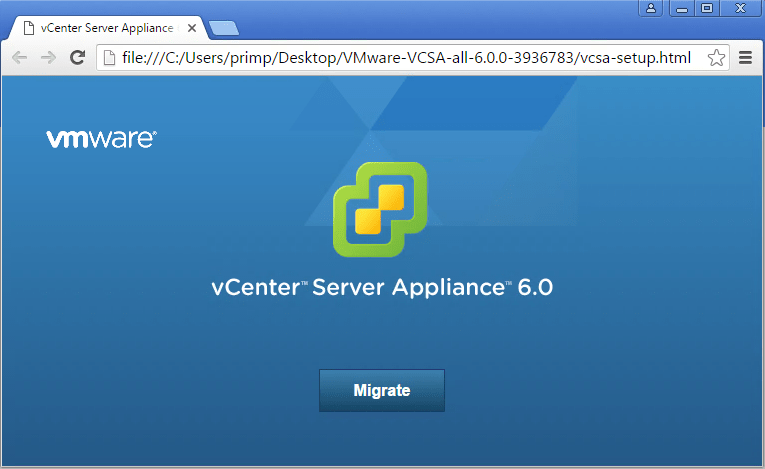 VCSA upgrades are "Migration" based upgrades and has been since the very first release of the VCSA in vSphere 5.0. Lastly, I should also mention that in vSphere 6.5, we have an updated version of the VCSA Migration Tool simliar to the one release with vSphere 6.0 Update 2m. It will now support migrating from a Windows-based vCenter Server running either vSphere 5.5 or vSphere 6.0 to VCSA 6.5. 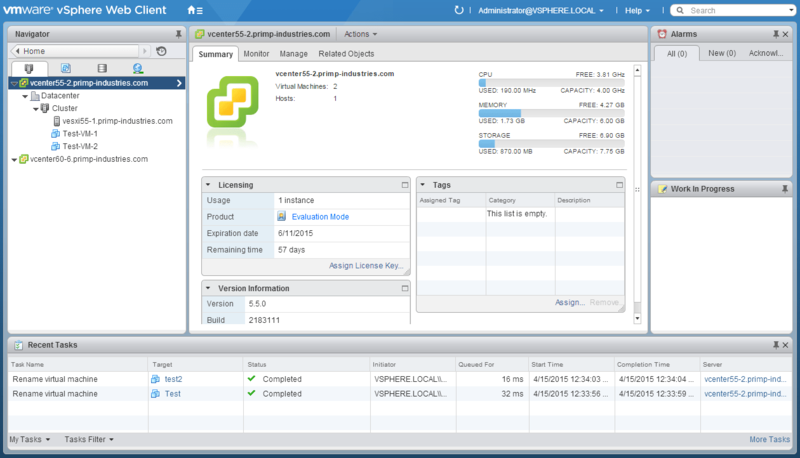 The vSphere 6.0 Web Client has been greatly improved with the release of vSphere 6.0 which includes a number of performance and UX enhancements. 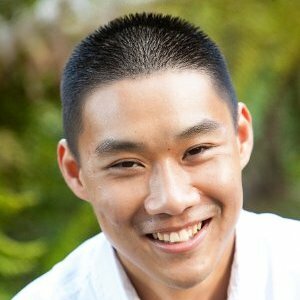 If you are interested in some of the details, be sure to check out this blog post by Dennis Lu, Product Manager of the vSphere Web Client. To really get the best possible user experience and to take advantage of all the new performance enhancements, it is recommend that you upgrade your entire vSphere environment which includes vCenter Server to vSphere 6.0. Having said that, I know this may not be possible for everyone immediately and it will take some time depending on your organizations software upgrade cycles and procedures, qualifications, burn in time, comfort left, etc. with vSphere 6.0 before completely moving over. Over the last couple of weeks, I have seen quite a few requests from customers who have expressed interest in being able to just use the new vSphere 6.0 Web Client with their existing vSphere 5.5 environment as they make their transition over to vSphere 6.0. I can definitely understand where these customers are coming from and honestly, the vSphere Web Client should just be that, a UI Client. We should be able to decouple it from vCenter Server and be able to iterate on it based on feedback from our customers and partners. I did some investigation and I actually discovered that we in fact support something called Mixed-Version Transitional Environment in vCenter Server for Windows Upgrade. This is a bit of a mouth full but basically you can have a hybrid vCenter Server environment that consists of both vSphere 5.5 and 6.0 as you upgrade to full a full vSphere 6.0 environment. I spent a couple of days researching this topic a bit more to see if I can come up with a solution that would ideally reduce number of changes introduced to a customers existing vSphere 5.5 environment while being able to leverage the new vSphere 6.0 Web Client. After many discussions, prototyping, snapshot reverts and with the help of one of my good GSS buddy G. Blair Fritz, we have come up with a very cool solution using the VCSA 6.0 as a "thin" vSphere 6.0 Web Client Server. The overall goal is to provide a period of time in which customers can use the new vSphere 6.0 Web Client with their existing vSphere 5.5 environment and when the time comes for a complete vSphere 6.0 upgrade, this "thin" vSphere 6.0 Web Client can be decommissioned and removed. Disclaimer: Though this hybrid configuration is supported, using the VCSA as a "thin" vSphere Web Client Server is not officially supported. Please use at your own risk. It is still recommended that you upgrade your existing vSphere 5.5 environment to vSphere 6.0 as soon as possible to get the full benefits of the enhancements made to the vSphere 6.0 Web Client. In my test environment, I have deployed a vCenter Server 5.5 which points to an external SSO (also running vSphere 5.5). Step 1 - The first step is to upgrade the SSO server to the new PSC 6.0, you will follow the existing procedure by mounting the ISO and going through the guided installation. At this point, you can continue logging into the existing vSphere 5.5 Web Client and access your vCenter Server and its hosts and VMs. 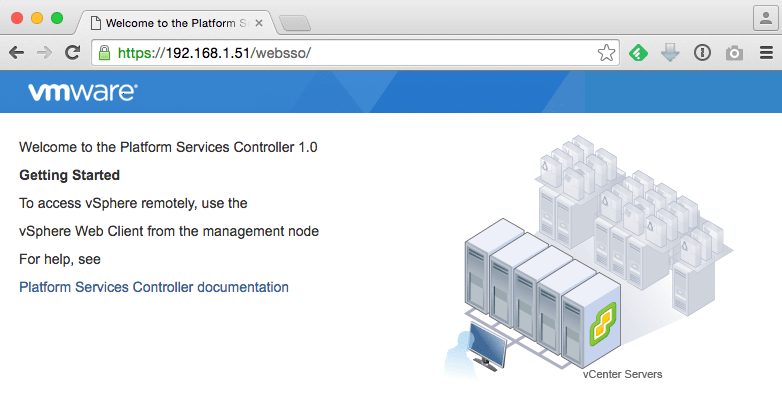 Step 2 - Next, you will need to deploy a new Embedded VCSA 6.0 using either the Guided or Scripted Installation. You will need to make sure that it is joining to an existing SSO Domain by specifying the upgraded Windows PSC that you performed in step one. The SSO Domain Name should be vsphere.local as this was not a configurable option in earlier vSphere releases. At this point, you can now login to the VCSA 6.0 which provides the vSphere 6.0 Web Client but you will notice that you only see an empty inventory of the new vCenter Server 6.0 as well as an error message stating "Login failed due to invalid credentials for one or more vCenter Server systems"
The reason for this is that you need to restart the vpxd service on your vCenter Server 5.5 for it to be visible in the new vSphere 6.0 Web Client. Note: It is important that if your external PSC is joined to an Active Directory Domain that you ensure the NTP Server specified in the VCSA 6.0 deployment also points to the same AD Server for the time source to be synchronized else you will run into problems later. 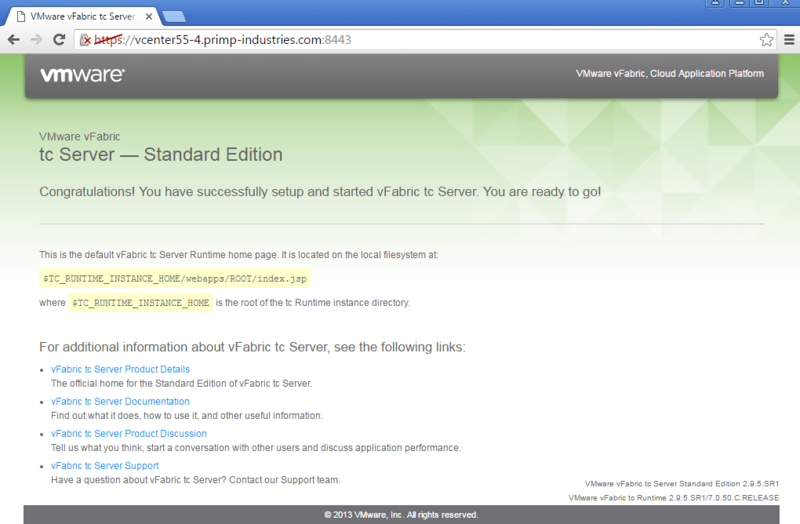 Step 3 - Login to your vCenter Server 5.5 and restart the vCenter Server service using the Services utility. Step 4 - Once the vCenter Server service has restarted, you can now open a browser to the Hostname/IP Address of the VCSA 6.0 and you will see both vCenter Servers. 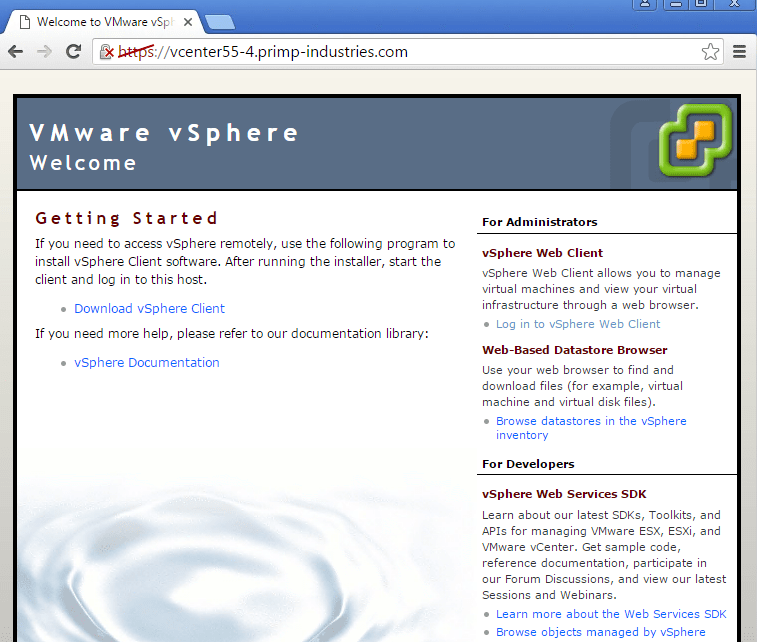 You can now manage your vSphere 5.5 environment using the vSphere 6.0 Web Client. I was pretty happy when I got this solution working but I was still not content. The smallest deployment size for an Embedded VCSA requires 8GB of memory, which is still a considerable amount of resources in my opinion. I wanted to optimize it further by turning off unnecessary services, modify the memory requirements for the unused services as well as un-registering the vCenter Server 6.0 endpoint so that you only see your vSphere 5.5 vCenter Servers only. Surprisingly, this took up the bulk of our research to figure out what could be turned off, how to properly turn it off and then un-registering the VC endpoint. Once everything completes successfully, you should turn off your VCSA and modify the memory from 8GB to 3GB. From my limited amount of testing, the overall memory utilization was sitting around ~2-2.5GB of memory, so I think configuring it to 3GB should be plenty and you can always adjust accordingly. Since we have disabled all the unnecessary services, the VCSA boot time should be pretty quick and now when you login to the vSphere Web Client, you should only see your vSphere 5.5 vCenter Servers and nothing else. When the time comes and you are ready to fully upgrade your vSphere 5.5 environment to vSphere 6.0, you can decommission and remove this "thin" vSphere Web Client Server by following the procedure outlined in this VMware KB 2106736. I think it would be really nice to be able to update the vSphere Web Client outside of updating vCenter Server and truly providing a "client" that is decoupled. What do you think? Back in VMworld 2013, the Office of CTO held its annual Fling Contest where customers can submit their ideas for cool new Flings that they would like to see. If selected, not only would the individual get a free pass to VMworld but VMware Engineers would also build and release the Fling, how cool is that!? There were over 200+ submissions that year and I was very fortunate to have been on the panel to help select the winner. The winning Fling for that year was the Windows vCenter Server (VCS) to VCSA Converter Appliance by Stephen Athanas. UPDATE 09/15/16 - The officially supported VCSA Migration Tool has has GA'ed with the release of vSphere 6.0 Update 2m. Please see this blog post here for more details. Customers want a migration path to be able to preserve all their vCenter Server configurations such as Folder structures, Permissions, Alarms, Tags, VM Storage Policies, etc. 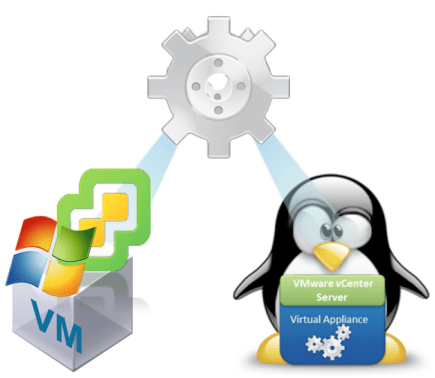 This is the idea behind the VCS to VCSA Converter Appliance which helps migrate a Windows vCenter Server running on an external Microsoft SQL Server Database to an embedded VCSA running a vPostgres Database. Today, I am very proud to announce the release of the VCS to VCSA Converter Appliance Fling. The Converter Appliance migrates the vCenter database, Roles, Permissions, Privileges, Certificates, Alarms and Inventory Service which contains Tags and VM Storage Policies. At the end of the migration, you will end up with a fully functional VCSA with the original hostname/IP Address fully intact and ready to use. As you can imagine, this was no easy task and we had some of the smartest VMware Engineers working on this project. Todd Valentine from the OCTO managed the overall program with Ravi Soundararajan as the Chief Architect working closely with Mike Stunes, Jignesh Shah, Raju Angani. Being a huge advocate and supporter of the VCSA, I also had the unique opportunity to be involved in this project and working closely with some amazing engineers to help design, test and validate the migration appliance. We hope you give the VCS to VCSA Converter Appliance a try in your lab (Please carefully read through the documentation along with the requirements and caveats before getting started). Let us know what you think by either leaving a comment here on my blog or on the Flings webpage. This is our first release and we already have some ideas of features and capabilities we would love to add to future releases but if there are things that you feel that are currently missing or enhancements you wold like to see, please let us know!